MARCOM's "Workplace Harassment in Industrial Facilities" Video Program discusses the various types of harassment that are found in the workplace, how they can affect an employee's work situation and what employees themselves can do to help prevent workplace harassment. When people hear the word "harassment" they usually think of sexually-related activity. But harassment encompasses a wide range of behavior... from practical jokes to intimidation. It can also include threats, verbal abuse and discrimination, even stalking and assault... and anyone can be subject to it. 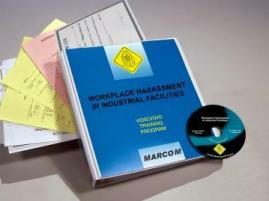 The videotape includes information on the nature of workplace harassment, how to recognize various types of harassment, how to handle verbal abuse and threats, the many forms harassment can take, how to recognize the many variations of "assault", knowing what to do, and what not to do, when confronted with a stalker, how fostering a positive workplace environment can increase productivity and safety, and more. The video program comes with a comprehensive leader's guide, reproducible scheduling & attendance form, employee quiz, training certificate and training log.